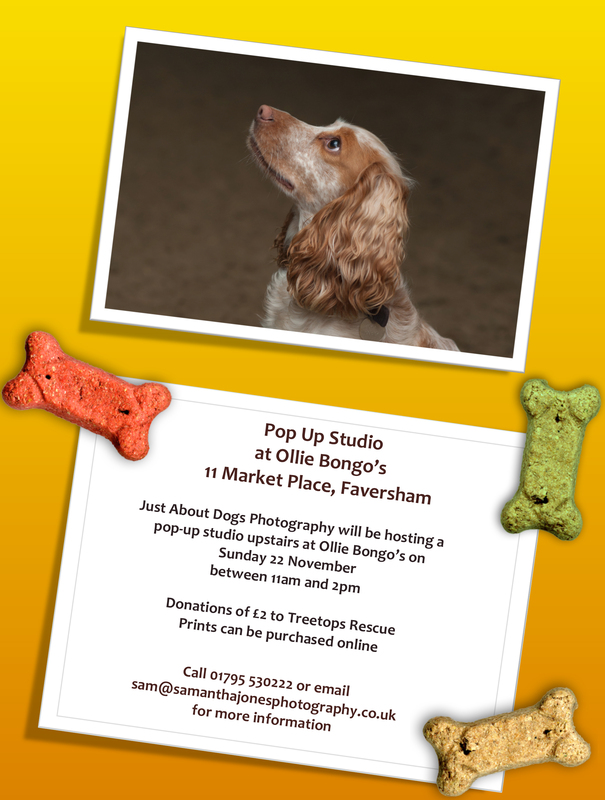 I’m delighted to announce that Just About Dogs Photography will be trialling a pop-up studio upstairs at Ollie Bongo’s, 11 Market Place, Faversham next Sunday 22 November between 11am – 2pm. The sessions will last around 10-15 minutes, will be on a first come, first served basis and we are asking for a donation of £2 to be passed on to Treetops in Whitstable, a charity supported by Ollie Bongo’s. Images from the sessions will be uploaded to an online gallery and prints can be purchased through the site. The stairs leading up to the pop-up studio are narrow and steep and therefore as a result, the sessions may not be suitable for every dog but we will attempt to accommodate as many dogs as we can. You can find out more information by called the shop on 01795 530222 or emailing sam@samanthajonesphotography.co.uk.